I just returned home from teaching my university classes. Well, I had another successful signing, another sell-out. I was at the Barnes and Noble in Mobile, Alabama last night. The manager, Ken Turner, is a fireball of energy and excited about my new children’s book. In him I’ve found a partner to work with in many future projects. We sold all of my books in the store and he had to send a worker to borrow more copies from the B & N at Spanish Fort, across the bay. 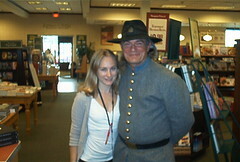 At his request, I wore my Confederate uniform and did 4 short sets of songs for the many teachers who had come. After the event, I drove back to Monroe and arrived home about 1:00 a.m. Once again, I made many new friends and booked some schools to present my program at in the future. God, I love this gypsy writer’s life!